Co. Monaghan: Ballymackney, Bocks, Carrickmacross (3), Corracharra, Crossalare, Donaghmoyne, Drumboorg, Drumcarrow, Drumgurra, Enagh, Kilmurry, Kiltybegs, Loughfea, Referagh. The Board also included 5 ex-officio Guardians, making a total of 21. The Guardians met each week on Thursday. The population falling within the Union at the 1831 census had been 36,927 with Divisions ranging in size from Corracharra (population 1,530) to Carrickmacross itself (6,140). 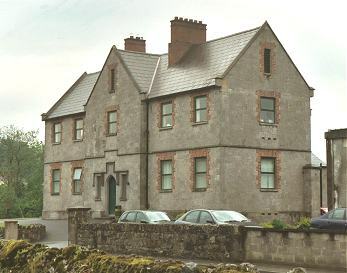 The new Carrickmacross Union workhouse was erected on a six-acre site at the north-west of Carrickmacross. Designed by the Poor Law Commissioners' architect George Wilkinson, the building followed one of his standard design to accommodate 500 inmates. 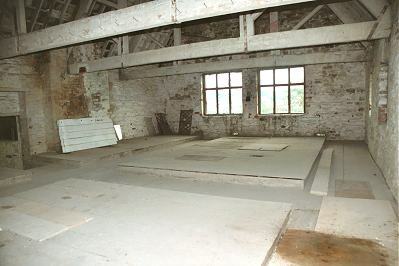 Its construction cost £5,000 plus £977 for fittings etc. The workhouse location and layout are shown on the 1909 map below. The workhouse was declared fit for the reception of paupers on 25th October, 1842, and received its first admissions on 11th February 1843. The original entrance and administrative block was extended westwards in 1851, ending in a three-storey cross wing in which children's accommodation and schoolroom were located. The upper floor of the children's block had the standard raised platforms on which the inmates slept. 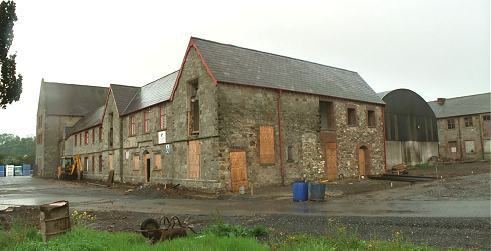 To the rear was an accommodation block, two-storeys high except for a three-storey cross-wing at the western end matching the children's extension in the front block. Ventilation towers in the roof were placed over the well-holes of internal staircases to improve the circulation of air through the building. In November 1843, more than police were were employed in enforcing the collection of rates at places at Ballytrain in Aughnamullen. 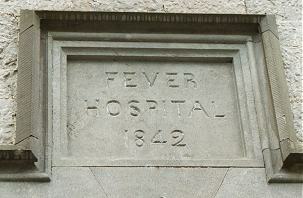 During the famine in the 1847, a fever hospital was erected on a separate site to the south-east of the workhouse. Additional accommodation for 249 was provided by constructing sleeping galleries in the workhouse and by hiring two houses. Their deserted and wretched cabins, their forlorn and distressing look, with pain and sickness so dreadfully depicted in every countenance, is horribly painful to look at; and with all this human misery, there is no person putting his shoulder to the burthen, — no proper efforts are being made to relieve the people. How it will end, God only knows. 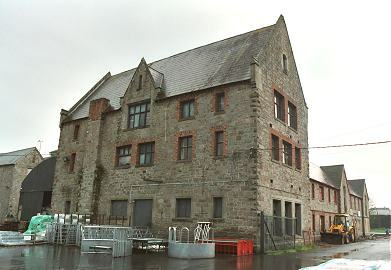 The Carrickmacross workhouse, together with the other three in the county, was closed on 1 April 1921. 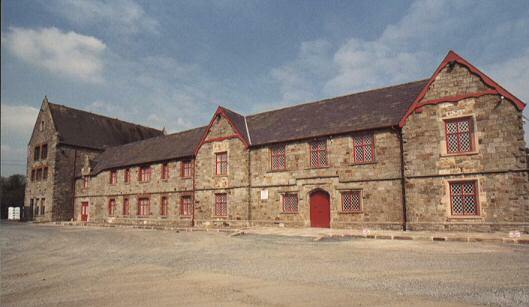 From the 1930s, the workhouse buildings were used for many years as a technical school. The chapel, dining hall, infirmary, idiot wards, fever sheds, etc. were demolished during the Second World Ward, when the Irish Army was practising for a potential attack from Hitler. The Farney Community Development Group is aiming to restore the buildings for a variety of local social and educational uses. 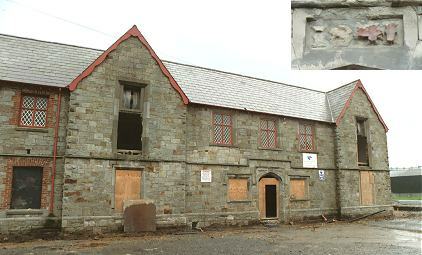 In 2002, after a long period of neglect, the entrance block was renovated for use as offices. 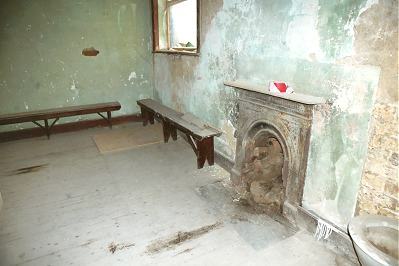 Future plans include restoration of the children's dormitory, the opening of a visitors' centre, and the purchase of the decaying rear building. courtesy Farney Community Development Group. Farney Community Development Group, Farney Workhouse, Shercock Road, Carrickmacross, Co. Monaghan. Presently researching details of approximately 50 Irish orphan girls transported from Carrickmacross Workhouse to colonies in Canada and Australia in 1847-54. All information very welcome. Thanks to Kevin Gartlan for the transcriptions of Samuel Roberts' letters.